Live Casino Comparer is happy to announce that LeoVegas have launched a Live Immersive Roulette App that will allow gamers to play Evolution Gamings live Immersive Roulette in glorious HD quality on their iPhone or iPad. The app has been specially created by Evolution Gaming to give IOS users the best possible playing experience. As an Android user myself I’m really jealous and can’t wait for an Android version to be released. 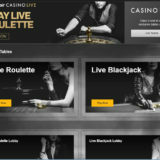 This complements an already great live mobile casino from LeoVegas which should give seasoned RNG Roulette players a great reason to try the live roulette product. What’s in the Immersive Roulette App? The App gives direct access to the Leo Vegas live casino game “Immersive Roulette”, which is streamed in high definition with 30 cameras giving great playing views during the spin of the wheel. Close ups of the dealer and wheel combined with slow motion technology really adds to the suspense of the game as you see the ball bounce from one number to the next before making it’s landing. Players can wager anything up to €250 per straight number with a total table bet amount of up to €5000. 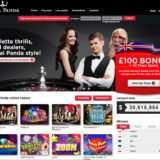 VIP‘s can take a seat at the top Live Roulette table in just a tap. It also offers a favourite bet feature, allowing players to save up to 15 bets in total. If you want to see what this is all about the click on this link to be taken to the App store where you can download the app and start playing. LeoVegas are one of the most popular mobile casinos having the widest selection of games of any online casino. 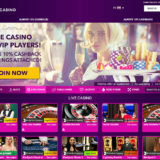 The live casino can be played on both desktop and mobile devices and is from one of the leading live casino software providers, Evolution Gaming. You can play Blackjack, Baccarat, Roulette, Casino Hold’em & 3 Card Poker and you’ll find they have some of the best Blackjack side bets out there.